As a full service freight forwarder and customs broker, we service worldwide origins and destinations without geographical restrictions. We work with only the most reliable truckers and warehouses to provide these services domestically and worldwide through our extensive agency network. We are intimately acquainted with the carriers in all trade lanes so we can direct your cargo the most suitable way, whether your goal is to minimize freight costs or meet seemingly "impossible" deadlines. We are your one stop point of contact for dealing with truckers, railroads, warehouses, steamship lines and government authorities, such as U.S. Customs and the Bureau of Export Administration. 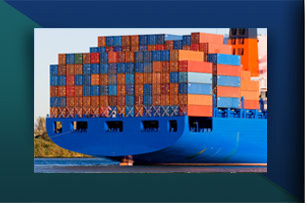 We provide marine insurance as well as surety bonds. Certified hazardous material experts, we can guide you on the proper classification and labeling of hazardous materials for international shipping. Letter of Credit experts, we can guide you as to whether L/C terms are fulfillable and in accordance with your understanding of the transaction. We prepare L/C documents accurately to ensure prompts payment and save on bank expenses due to unnecessary discrepancies. We can readily arrange for consular legalization of documents for countries that require it. We file all export declarations electronically, as required by U.S. Customs and Bureau of the Census.